HRANA News Agency – Hunger striking Sunni men from Iran’s Kurdish minority are in grave danger as their health deteriorates after 64 days on hunger strike. They have been on hunger strike in protest at their death sentences and the conditions in which they are held. Jamshid Dehghani, his younger brother Jahangir Dehghani, Hamed Ahmadi and Kamal Molayee, who have been on a “wet” hunger strike (taking water but not food) since 4 November, are now in critical condition. All four men have repeatedly lost consciousness since 30 December. Because of this, they have been given intravenous fluids in the clinic in Ghezel Hesar Prison in Karaj, north-west Tehran. They have apparently refused to receive the intravenous fluids each time they have regained consciousness. Sedigh Mohammadi and Hadi Hosseini, who had started a hunger strike along with the other four men, ended their hunger strike on 28 December, after their state-appointed lawyers told them their death sentences had been overturned. Amnesty International understands that the Supreme Court has overturned the sentences due to the mental health concerns of both men and has ordered a retrial by a lower court. 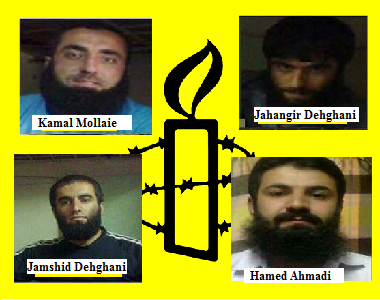 The four hunger strikers, Jamshid Dehghani, Jahangir Dehghani, Hamed Ahmadi and Kamal Molayee, were sentenced to death by Branch 28 of the Revolutionary Court of Tehran on 14 November 2010 after being convicted of vaguely-worded offences such as “enmity against God” (moharebeh) and “corruption on earth” (ifsad fil-arz). They were denied the assistance of a lawyer during their trial.